I've been a cat owner for most of my life and have learned many tips and tricks for keeping cats happy and healthy. Cats are naturally clean animals. They love snuggling in soft blankets or a basket of fresh laundry. If your cat is not using the litter box, we need to figure out why before we can find a solution to this frustrating problem. 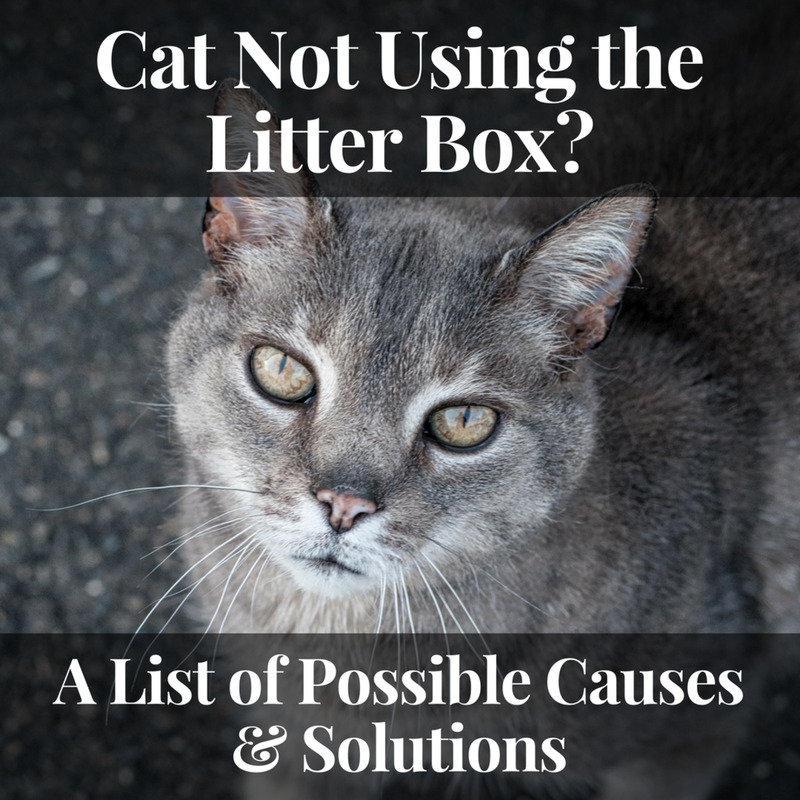 Whether it's an undiagnosed medical issue or just the case of a dirty litter box, this article will discuss many of the common possible reasons for a cat not using the litter box and offer ideas and advice for solving each one. What area(s) outside the litter box is your cat going to the bathroom? 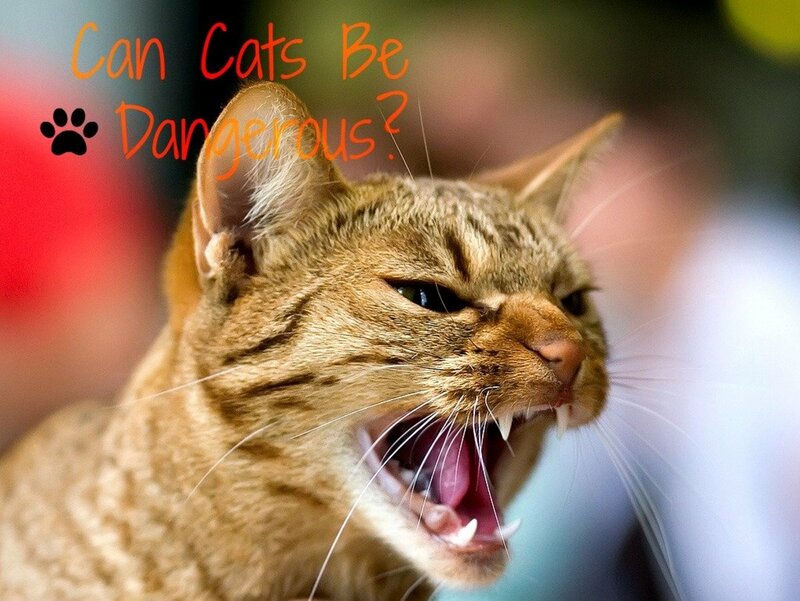 If a cat isn’t using the litter box, especially if he or she always has in the past, it might be a cause for concern. A cat with a health problem such as a urinary tract infection or arthritis may associate pain with using the box and decide to go elsewhere. Cats are extremely talented at hiding symptoms of illness, so it’s up to you to notice any changes in their habits or behavior. To rule out a medical reason, check with your veterinarian. If a problem is found, the sooner it’s treated, the better. 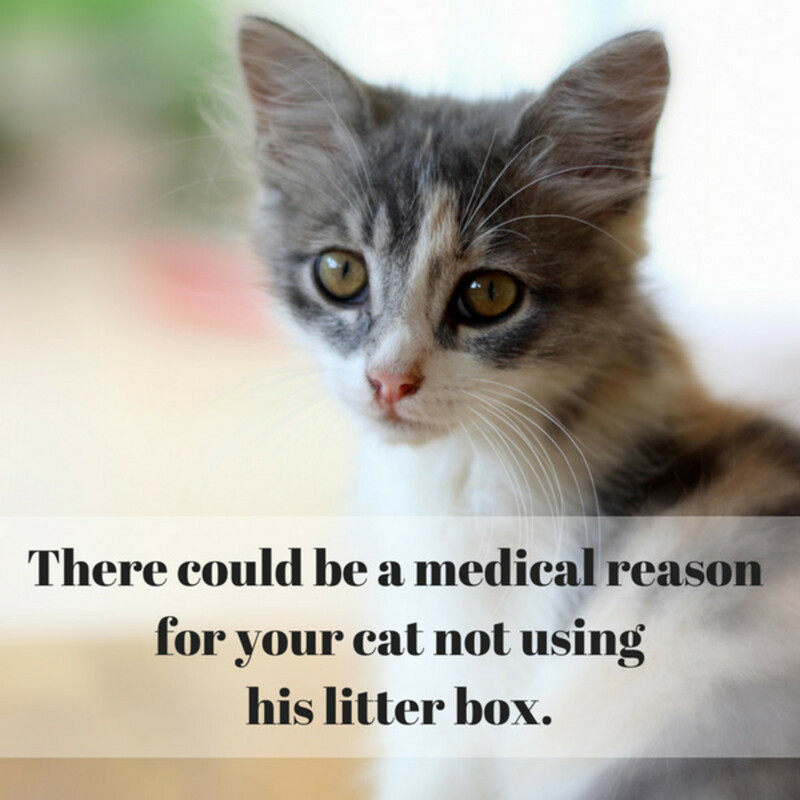 Once your cat is feeling better, it’s likely he’ll resume his normal litter box habits. Cats that aren’t spayed or neutered may be more prone to mark their territory by spraying. Many people believe this issue is only associated with male cats, but female cats can spray too. Cats might start spraying when another cat is introduced to the household or even if they see a cat lingering outside the house. Spaying or neutering can help curb spraying, as well as prevent certain cancers and unwanted behaviors such as aggression. 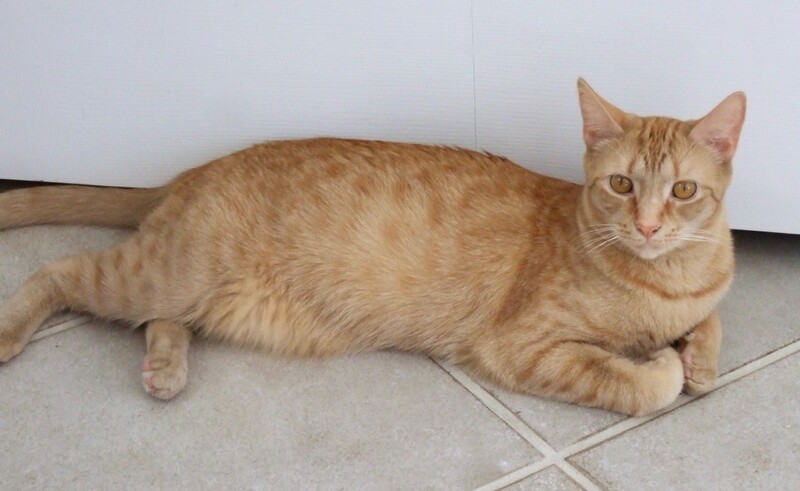 Unless you're a breeder, it’s beneficial to spay or neuter your cat. Some cats have never learned how to use a litter box. Perhaps they were taken away from their mother too young or lived outdoors in the past and litter boxes are unfamiliar to them. Cats already have the instinct to hide their waste, so training is fairly easy. Just wait at least fifteen or twenty minutes after the cat eats or plays and put him near, but not in the box. Hopefully he’ll step in on his own and start digging around. After he goes, praise him and repeat this process until he’s consistently using his box on his own. There are a variety of litter box issues that can cause a cat to not to use its litter box. Some cats are very picky about their boxes and making even one small improvement might make a huge difference. How often do you scoop? If you aren’t scooping once or twice a day and fully replacing all the litter once a week, your cat may be trying to tell you something. 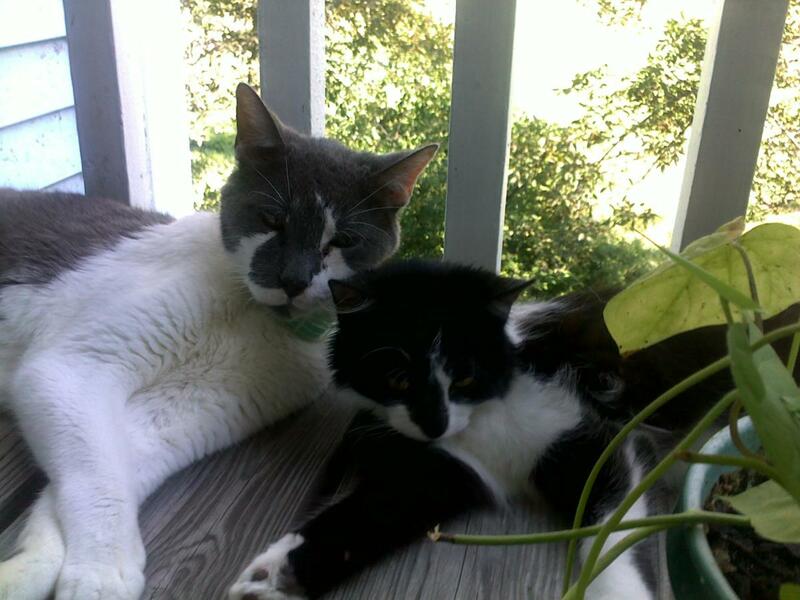 They don’t want to use a dirty litter box any more than we want to use a dirty toilet. Try keeping your cat's box as clean as possible. 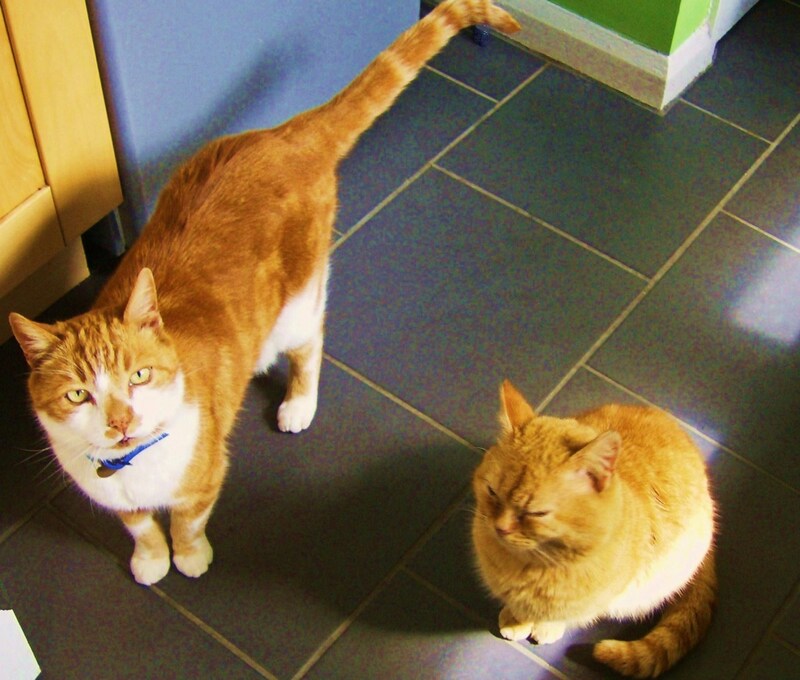 Litter boxes can fill up fast, especially in multiple cat households. Keep a bucket and scoop near the box as a reminder to scoop morning and night. Dump the scooped litter into a garbage bag or dispose of it in a covered trash container to keep odors away from the litter box area. It’s important to fully clean the litter box once a week to keep it as odor-free as possible. I’ve found it helpful to set out a backup box in case the cat needs to use the bathroom before the cleaning is done. It’s easiest to clean the box outdoors, but if that’s not possible, the wash tub in your laundry room is the next best place. Supplies Needed: A pair of rubber gloves, a place to dispose of old litter, a litter scoop/bucket, mild dish detergent, white vinegar, old towels or paper towels for clean-up and fresh litter. Dump out all old litter. Use a scoop to scrape any that’s stuck to the sides or bottom. Wash the entire box with a mild dish detergent and warm water. Don’t use bleach, ammonia or any other harsh chemicals that are harmful to cats. If there are still odors after a thorough washing, swish a 50/50 white vinegar and water mixture inside the box to help neutralize the smell. Be sure to rinse until there’s no vinegar scent in the box. If there are still cat odors in the box after this process, it’s time for a replacement. 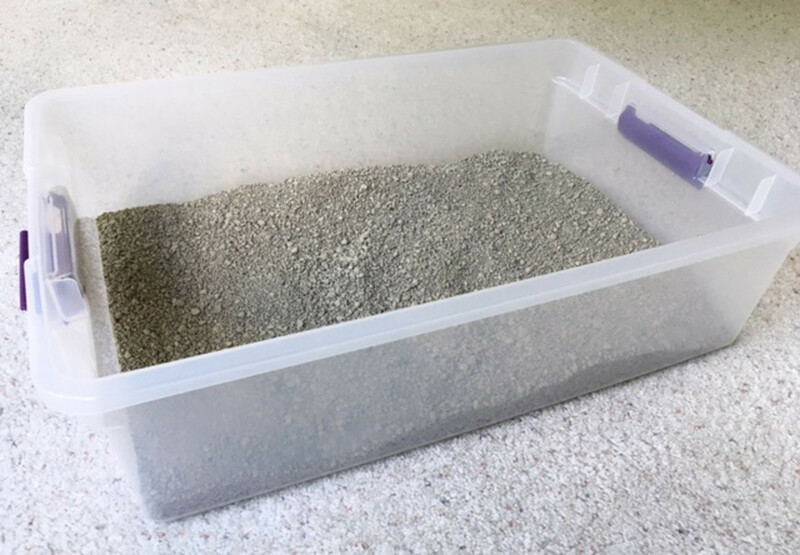 Dry the box completely before adding fresh litter. There are so many new and interesting types of litter to choose from these days. Varieties like ‘clumping’, ‘flushable’ or ‘scented’ might sound good to us, but our cats often have different opinions on the subject. For example, if you’ve been using plain litter for years and then suddenly switch to a ‘scented’ variety, your cat might start avoiding the litter box just because the fragrance bothers him. Each cat has his or her own preference of litter type. If the timing of your cat not using the litter box and starting a new type of litter coincide, you’ve likely figured out the problem. Get a second box and fill it with a different type of litter than you currently use. For example, if you’re using a clumping variety, try a plain clay one. If you use clay, a try one made from corn, wheat or pine. If you’re not familiar with the various types available, ask someone at your local pet store. Keep the two boxes near each other and notice which one your cat uses most often. If your cat uses the new type most frequently, consider switching to this as his regular litter. If he’s not using the new one, try other varieties until you find something that works. 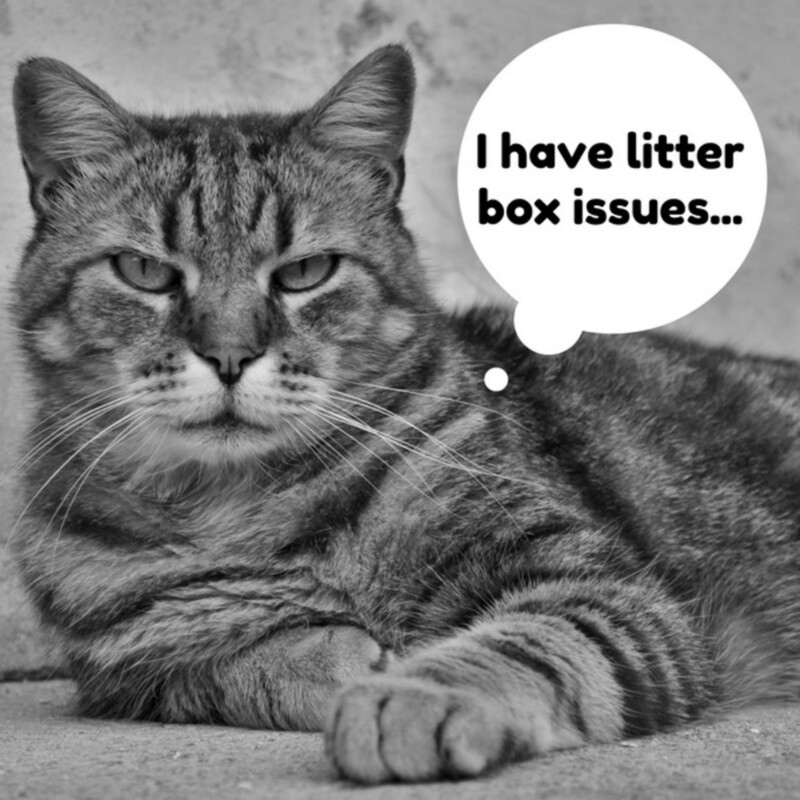 Switching types or brands of litter too often can cause some cats to stop using their box. It may be tempting try the latest type of litter or buy whatever brand is on sale each week, but cats like consistency when it comes to their litter. If you have a picky cat, he might not be happy with stepping into a box of litter that he’s unfamiliar with. Once you find a type and brand of litter that works for your cat, try to stick with it. If you need to switch to something else, make the transition over a week or so, mixing the old and new litters together in the box until your cat adjusts. 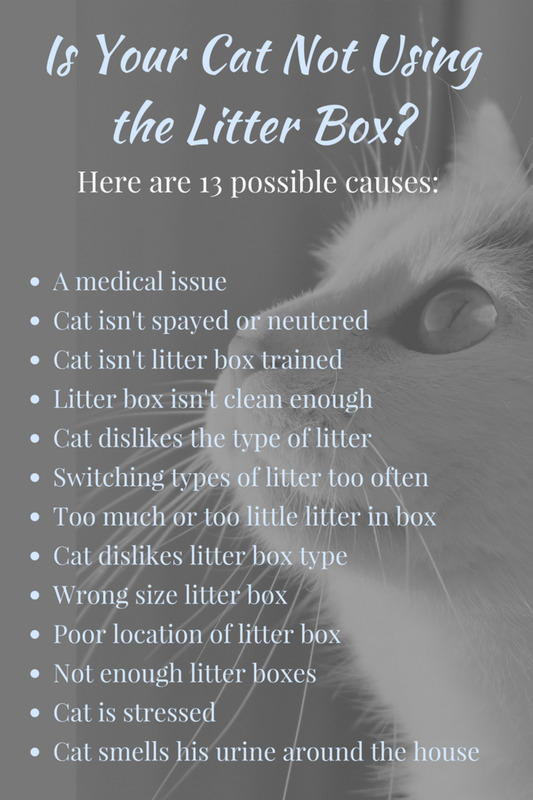 If there’s not the right amount of litter in the box, it makes it more difficult for your cat to properly cover his urine and stool. The level of litter gets lower each time you scoop, so this can become a problem if it’s not replenished often enough. Too much litter is another problem you’ll want to avoid. It’s wasteful, it makes the box harder to empty and the litter is likely to spill over the sides of the box as he digs. Some cats will even go to the bathroom next to the box because they find some litter scattered on the floor. The right amount of litter can vary by type and brand. Typically, two to four inches is a good amount, but it’s best to follow the instructions on the bag or box. As you scoop throughout the week, add some additional litter to maintain the right level. Cats can have distinct preferences about their litter box. If your cat’s not happy with type they have, it’s another possible reason for him not using it. There are many types of boxes to choose from and finding the right type for your cat is important. Consider your cat's size, level of mobility and the location you plan to keep the box as you choose one. Is an Open or Covered Box Best? Some cats don’t care for covered or enclosed boxes because they feel too confined. They also tend to trap odors. If you’re using a covered box and it’s not working out, consider getting an open style one. I’ve always used open boxes and my cats like them. Some litter can get scattered outside the box as they step out, but keeping a large mat beneath the box traps most of it. Open boxes make it easy to scoop out dirty litter, refill and keep clean. Some cats will not use a box that's too small and confining. It's common to purchase a litter box for a new kitten or young adult cat and forget to buy a larger one when he or she becomes full size. It’s important to choose the right size box. A cat needs enough room to fully turn around and dig to cover his waste. The sides of the box need to be at a height that allows the cat to easily get in and out. This is especially important for small kittens and older cats with arthritis or other health issues that cause them to have trouble getting in and out of the box. If you have a larger cat and can’t find a big enough box in a pet store, try a clear storage container. These boxes are available in sizes that are just a little longer and wider than many of the litter boxes I’ve seen in pet stores. I use them for my 12 and 14 pound cats and they seem to appreciate the extra space. If the litter box is located in a less than ideal area of your home, it might be the reason why your cat is avoiding it. This problem can be solved by moving the box to a better location. If you have more than one cat in the home, litter can get dirty fast. Cats aren’t fond of climbing into a smelly, dirty box to use the bathroom, so it’s not all that surprising some cats choose to find another place to go. In multiple cat households, some cats “claim” a box as their own and may even intimidate another cat about using it. The basic rule of thumb for litter boxes is “one per cat, plus one extra”. Yes, it’s a little extra work to maintain multiple boxes, but each one stays clean longer than if you only have one. Cats definitely are creatures of habit. Changes in their environment or schedule can be stressful for them and be a possible cause of them not using the litter box. 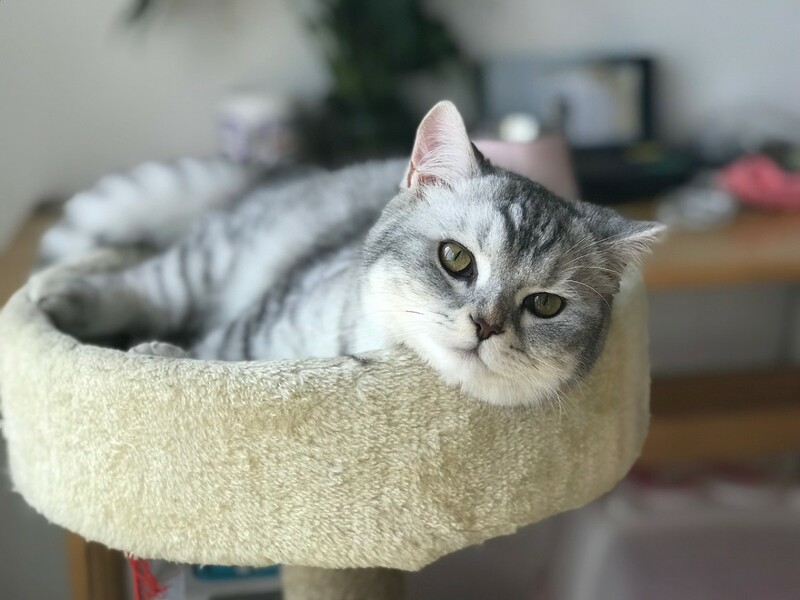 Stressful events for cats can include moving to a new home, travel, having a new family member or pet in the home, being in a pet boarding facility, or having noisy remodeling work done in the home. Litter box troubles can also happen with a cat that’s brand new to your home and is stressed about being in a new and unfamiliar place. Many situations that stress a cat are impossible to avoid, but keeping his or her routine as normal as possible can help alleviate stress. Basics like a regular feeding schedule and time for play and rest throughout the day can go along way in keeping things normal. Bach Flower Essences Rescue Remedy for Pets - This is a homeopathic remedy that can help calm anxious cats, which in turn can reduce destructive behaviors like spraying. I've found this remedy to help mellow my cats when they're stressed. If you think your cat’s litter box problems are due to stress, your veterinarian can offer you additional advice or prescribe medication to help your cat feel calmer until the situation resolves and he or she resumes a normal routine. As your cat walks around your home, if he can smell the areas where he used the bathroom, he might think these are acceptable places to go again. Cleaning these areas thoroughly is a key part of solving the problem. Here are some suggestions for cleaning up after your cat. For hard surfaces, clean the area completely with your regular cleaning product. Afterwards, go over the area with a 50/50 mixture of white vinegar and warm water to help neutralize odors. An enzymatic pet odor remover (found in pet stores) is also very effective for removing any traces of odors left behind. For carpet, rugs and other fabric materials, blot the urine with paper towels until it’s totally absorbed. Don’t rub, because that makes odors harder to remove. Clean the material with a mild dish detergent and warm water, followed by an enzymatic pet odor remover product. 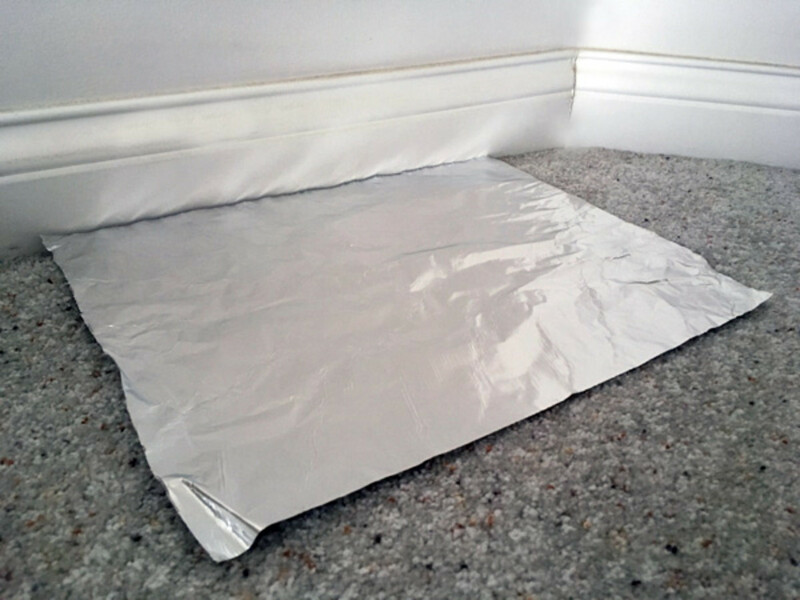 After the material dries, place sheets of aluminum foil loosely over the area to discourage the cat from returning to the spot. Never use ammonia for cleaning up messes your cat leaves behind. It’s hazardous to cats and the scent will attract him to return to that area. Also, please test any cleaning products you plan to use to make sure they don’t damage surfaces or stain fabrics. Cats like knowing they’ve done something good, so praise your cat when they use their box. 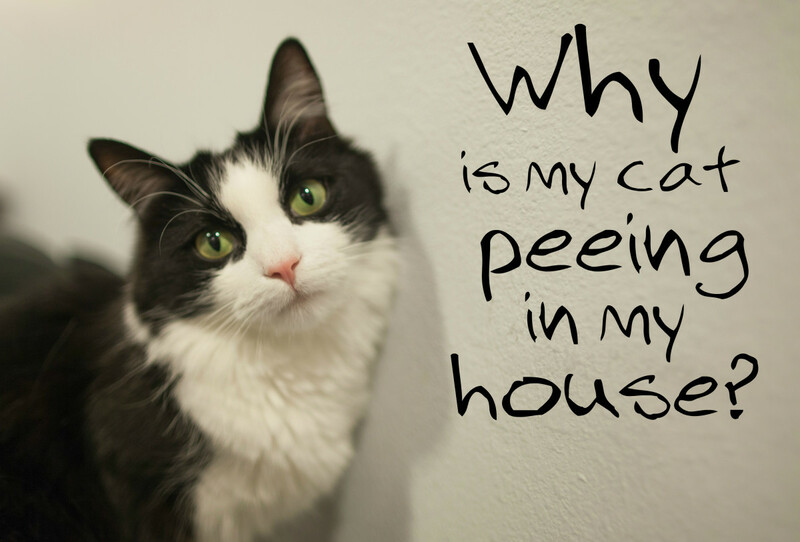 Don’t yell at or scold your cat about this problem. It will scare or confuse the cat, but it won't solve anything. 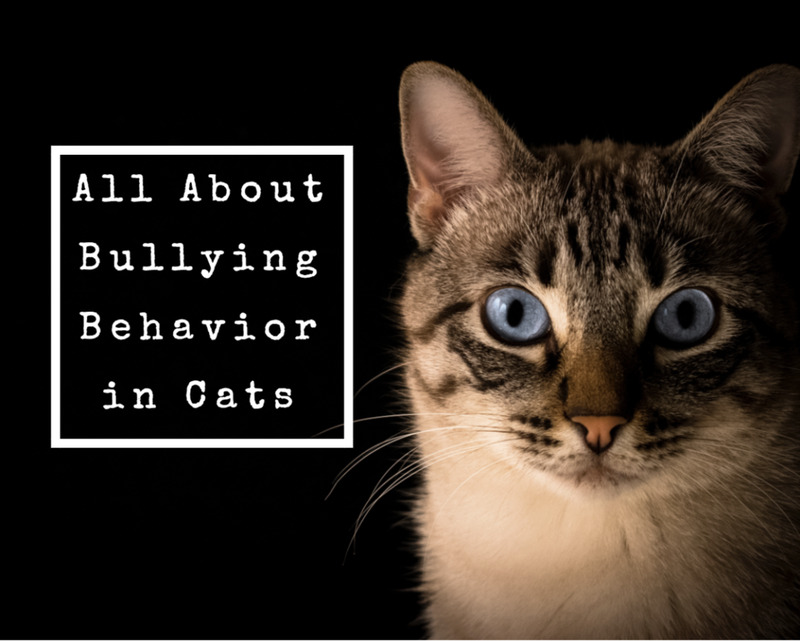 If your cat still isn’t using the box after you’ve ruled out medical problems and tried the other solutions, consider working with an animal behavior specialist. This person can help you to get to the bottom of the problem. Ask your vet for suggestions or do an online search for qualified animal behavioral specialists in your area. I hope this article has given you some insight into this issue. If any of these solutions have worked for your cat or there's something else you've tried that helps, please feel free to leave your comments below. Thanks for sharing this, Tranquilheart. It's a good idea to try different litters for picky cats. I'm glad you found one that works for her. I appreciate your comments. Litter box issues are very tricky. I have a 7 yr old long haired cat that is a total princess.She was surrendered because she didn't get along with other cats. I've never encountered such a finicky cat. I use 2 litter boxes, she pees in one & poops in the other -- I don't scoop, I put enough to cover the base & dump out completely. I had to try 3 types of litter before settling on regular non clumping clay in an uncovered litter box. She'd limp about & sometimes poop around the house. Naturally we thought it was because of a health issue. But the vet found no problems. I tried someone's advice & bought a "softer" litter, pellets made of recycled paper and she loves it. I guess she has sensitive paws. Just sharing here in case some one else has this issue with their cat. Thank you im going to get a bigger box and clean where he stared going which is right besidewere i sit its like hes scared of getting to far away from me.but he has used his box twice last week. My daughters cat has been leaving a little something for us shortly after she moved home after school. I just realized that where she was leaving them was where a litter box used to be before the daughter moved out. So I placed a litter box in that spot to see if that would help. I am not sure yet as I just set it up a few minutes ago. Its interesting how cats get used to things in a certain order and in certain places. Thanks much, DzyMsLizzy! I hope things get better for your senior kitty. I know how rough it is when they get health problems as they get older. We have 6 cats...but only space for 3 boxes. By scooping often, the litter stays cleaner, and the cats don't seem to mind. The only cat that gives me a problem is a "senior-catizen," who is 14 years old, and has been on strong drugs for 13 of those years to control her epilepsy. She is now having digestive problems (the vet found no obvious cause), and the result is that she has to stay out in the garage overnight, as she simply cannot seem to remember where the box is...even the one we have out there for her exclusive use. So, my day starts every morning with cleaning up after her..and cleaning HER as well... :-( But, she was our first kitty, and we still love her, so we take care of her because that was the commitment we made when we adopted her. Your suggestions are very good, and helpful for the majority of situations. Voted up, interesting, useful and shared.